Royal Cats is a casual running platformer video game where you take control of three cats who just wanted to eat some tasty royal food. To do that, the three cats must stand on top of each other and pretend to be a knight by dressing up as one. Avoid all the traps in the kitchen by jumping individually and try to steal the King’s dinner. The game features many fun levels, each more challenging than the last. Will you be able to complete all levels and steal all of the King’s food? Help the three cats pretend to be a soldier and get some tasty food in this funny and cute platformer video game – Royal Cats! Steal the King’s dinner and jump over all the traps and hazards in the kitchen! 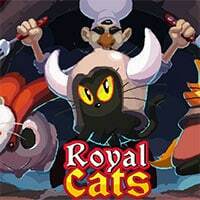 Royal Cats is a free online action game on Round Games.